NOTA: Una versión editada de esta entrevista apareció originalmente publicada en la revista Latin Beat Magazine, en la edición de febrero, 2009 (Volumen 19, Número 1). Aparece en su versión original por cortesía de Rudy Mangual. Venezuela has always been one of salsa’s best markets and home of great artists. And, although the greatness of the past —as it happened in New York and other places―, is a matter of history, once in a while there is a voice that fights to be heard, a force that you can’t resist. One of those voices is Gerardo Rosales. 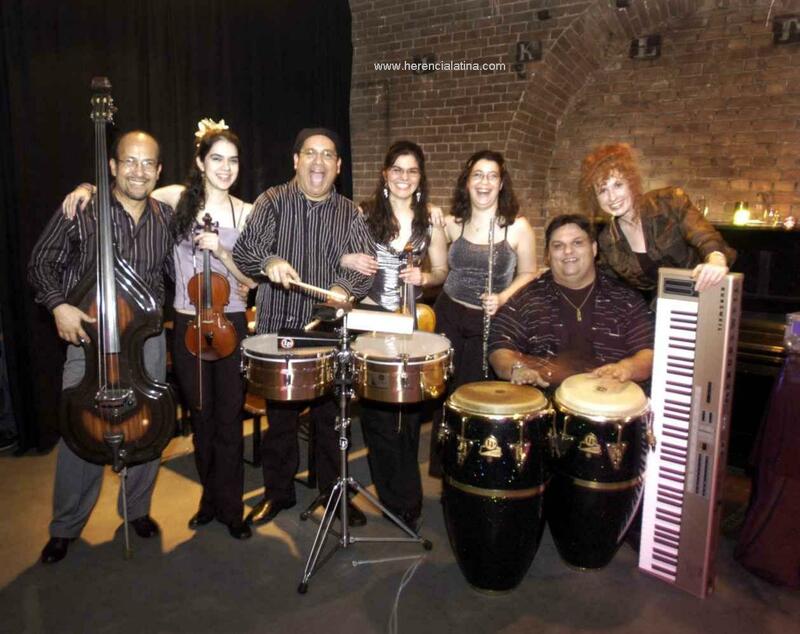 A gifted percussionist by trade, Rosales was already an established talent in his native Venezuela, before moving to Europe and establishing residence in Holland. Since then, his discipline and enthusiasm has allowed him to have a beautiful family and create great music non-stop. I can’t think of any musician right know ―with the probable exception of John Santos— that releases so many recordings continuously. All this is done in an atmosphere in which recording one CD —only one, for God’s sake—, is a very risky adventure. You have to really love music to do it, and that is what Rosales has successfully been doing for a while. In the following interview, “El Tamborero” ―term that Rosales uses in regards to his art―, talks about his artistic life so far and gives us a glance at the future. Lets’ start from the beginning. My name is Gerardo Antonio Rosales Rondón. I was born in Caracas, Venezuela, on the 6th July, 1964. My mother’s name is Alicia Rondón and my father’s name is Ildemaro Rosales. Both of them were athletes. My sister and brothers from my father’s side are called Nena, Ildemaro and Javier. Unfortunately my brother Javier died. Nena is a housewife and Ildemaro is a marine biologist. I am the only musician in the family. While my mother was working to maintain us, my grandmother Belén Rondón took it upon herself to raise me. To them I owe my musical development, because they allowed me to play with all the pots, pans and buckets in the house. Moreover, they bought me my first drums. My grandmother also raised my cousin Gladys. When Gladys was fifteen years old, she fell in love with Luis, a guy who owned a pick-up. In no time, Luis was keeping hundreds of LP’s in our house. That was the rock era, at the end of the 60’s. They were both rock fans. One day, while I was browsing through the LP collection of Luis, I found the LP “Hard Hands” by Ray Barretto. It caught my attention and I asked for it to be played. When I heard the rhythm, I fell in love with Salsa music. I owe my love for Salsa to Ray Barretto. Later on, I began a collection of Salsa Brava. 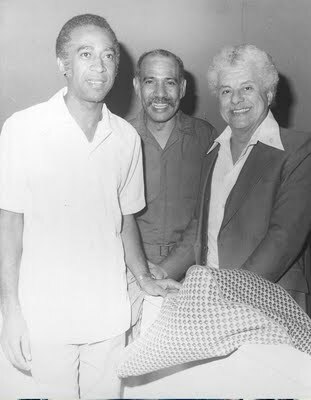 Tata Guerra, Phidias Danilo Escalona and Tito Puente. I also often listened to the radio, specially the program “La hora de la salsa” by Phidias Danilo Escalona. In the 70’s, Radio Aeropuerto played Salsa Brava 24/7. When I was a child, I saw the Fania All Stars, Típica 73, Dimensión Latina, Ismael Rivera, Tito Puente, Machito, Ray Barretto and many others on (black and white) television. I learned to play music just by listening to and looking at these programs. Venezuela was the door to the success for all the Latin-American artists. Everybody went through there. Can you elaborate on how the salsa environment was in Venezuela by the time you left? I lived with my mother and grandmother in the urbanization Las Palmas, Murcia building, 5th floor. Across our building was an odontology school, where they used to have parties (weddings, 15th birthday etc.) each weekend. From my window at the 5th floor, I could perfectly see and hear everything what was going on in that club. They had an outdoor café where all the famous salsa bands of Venezuela used to play: Porfi Jiménez, Sexteto Juventud, Federico y su Combo, la Billos and many more bands. My grandmother used to yell at me: íDuérmete, muchacho!” (Go to bed, little boy), but I was standing in that window receiving lessons. While I was enjoying the music, the neighbors used to complain and always called the police. The ‘rockeros’ and ‘salseros’ did not get along very well. The rockers called the salsa lovers “monkeys.” They used to say that salsa was fringe music of the suburbs. The higher mid class and rich people used to listen to rock, classical music or jazz. Nevertheless, these social separations did not last long, because in the seventies salsa reached maximum popularity. The phenomenon Fania captured all attention till the end of the seventies. In the eighties merengue finished salsa off. Only Roberto Blades managed to be heard on the radio in that era. I have to clarify that I have always been ‘salsero’ and I kept out of the fashions, although, to survive, I had to play commercial music. Nevertheless, I never stopped playing salsa or creating projects. It was difficult at that time, but real ‘salseros’ never die! In the nineties, salsa started to recover. In my opinion, salsa made a comeback in 1987, the year that Ismael Rivera died. Radios started to play salsa again and ‘salseros’ woke up! For me, Maelo was so great that even after his death he helped rescuing the fallen salsa. Months after his death, Trina Medina, Joe Ruiz, Nano Grand, Franklin Rojas and I we paid tribute to Ismael Rivera in the ‘Museo del Teclado’, a place in the central park of Caracas. It was such a huge success, that lots of people could not get in. This was a wonder of Saint Maelo. I have to say that in all periods in Venezuela we listened to Mexican rancheras, Cuban music, boleros, traditional merengue and the Colombian vallenato. We were raised listening to Sonora Martancera and the Billos Caracas Boys. Ruben Blades has always been present at the radio. In Venezuela, there is a saying that when a boy becomes a man his interest for the music of Ruben Blades starts as well. In diverse periods, Venezuela has had different original bands and musicians, such as Grupo Mango, Dimensión Latina, Oscar D’ León, el Trabuco Venezolano, Aldemaro Romero y su Onda Nueva, Guaco, Un Solo Pueblo, Alfredo Naranjo, Aquilez Báez, Cheo Hurtado and Huascar Barradas a.o. Did you make a recording in Venezuela —as leader or otherwise―, before establishing yourself in Europe? Venezuela was my school. At high school, when I was 11 years old, we jammed with the students. Once, a friend told me, “I know a very good conga player and he has a percussion school at the Sarria suburb.” The conga player was Orlando Poleo. At his percussion school my formation as a percussionist started. I was thirteen years old when I got my first job. I earned 50 Bolivares playing the piano with a group of friends in Catia. I played throughout all the suburbs of Caracas. That way I learned what a "street guaguancó" was. At that point, I stopped with my studies, and I dedicated myself to play music. My family supported me on that decision. At the age of seventeen I worked at the television for Canal 8 VTV, with a piano player, Tony Monserrat. 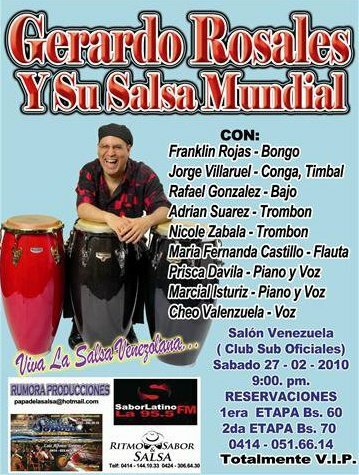 I have been a percussionist for the most important artists of Venezuela: Soledad Bravo, Cecilia Todd, Víctor Cuica, José Rosario, Canelita, Trabuco Venezolano, Joe Ruiz, Orquesta Café, Ilan Chester, Adrenalina Caribe, Jarana, Ricardo Hernández, Ajoporro, Mango and many others. I did my first professional recording in 1986, with Ricardo Hernández, ex director of Guaco. I played the congas, together with Angel ‘Cachete’ Maldonado. 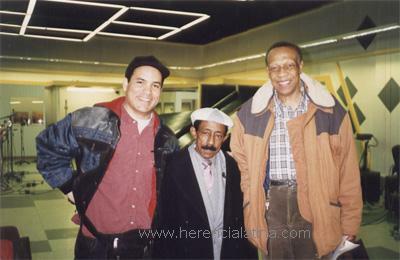 In 1987, I recorded with La Orquesta Café, together with the ‘Sonero Mayor de Venezuela,’ Joe Ruiz. With that band we were the supporting act of Ray Barretto in the Poliedro, in Caracas. This video can be watched on youtube. In 1989 I founded my own band, named “Salsa 70.” With ¨Salsa 70¨ I played in the 80´s and at the early 90´s in all of Caracas´ suburbs and bars. In 1990 I recorded an LP named “Salsa Pa’lante de Venezuela.” This was my first recording with my own band in Venezuela. With these recordings a learned everything about being an independent producer. I lived all processes from recording till manufacturing the CD. This was a tremendous experience. Who taught you to play the piano? When I was five years old, my mother hired a piano teacher named Mr. Gaona. He was Argentinean and taught me the musical notes and chords. Everything I learned, I converted to salsa. I played the piano till I was 23 years old. One day I decided to dedicate myself to percussion. I have to say that having studied piano helped me in interpreting percussion instruments with a sense of harmony. Great examples for me were Ray Barretto, Patato, Tito Puente and Candido. Besides being ‘tamboreros,’ they also played melodic instruments like the piano, the guitar or the bass. Why did you decide to establish residence in Holland? One day in 1992, I received an invitation from the band “Caracas son 7” to play with them at the Expo Sevilla. After the Expo Sevilla, we stayed in Spain and started our adventure in Madrid. One day, when we were playing in Madrid, a really beautiful Dutch girl appeared in the bar. Not only did she speak Spanish, she also knew how to dance salsa. We became friends and she invited me to come and visit her in Holland. The only information I had about Holland was that they had a lot of cows, milk, cheese and flowers. Arriving in Holland, I noticed that there was much more than that. Because I really liked the atmosphere, I decided to stay. When I arrived in Holland in 1993, there were only a few percussionists, so I started to give percussion lessons. I had a lot of students and many of them are professional percussionists nowadays, which can make a living out of music. 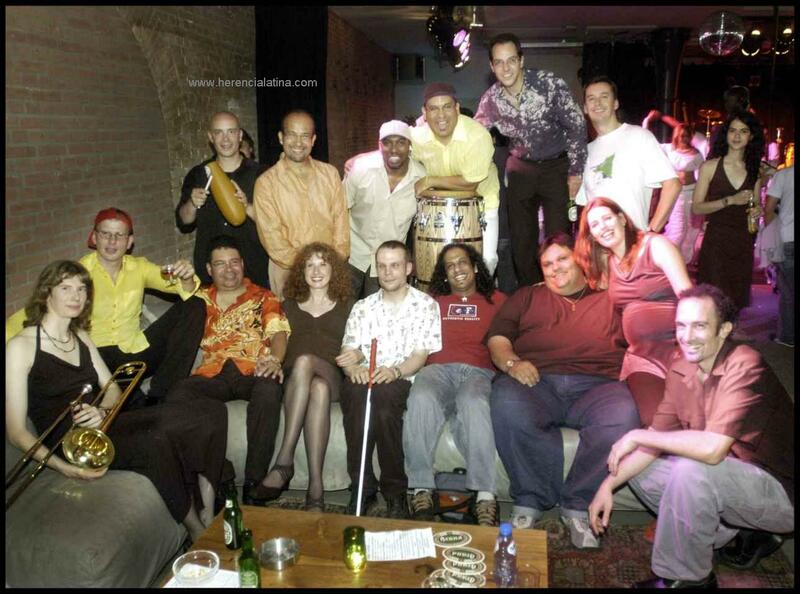 For this reason, I feel that I have been responsible for the development of Latin percussion in Holland. From Holland I managed to produce my CD's and have been able to do multiples tours and concerts in Holland as in Europe and Asia. Can you elaborate on the first recording that you did in Venezuela, “Salsa Pa’lante de Venezuela”? At a young age, I understood that if you don’t make an effort to record your music, nobody will ever hear about it. It was clear to me that if I would wait for a record company to finance my project, I would still be waiting! That’s why I took the initiative to start recording at my own means and I convinced the musicians of this situation. My first production was made without hardly any money. It took me 3 years (1988 – 1991) to record it. I need to say that my whole life has been like this. There is never money to realize a recording, but we have to go forward (¡vamos pa’lante!). “Salsa pa’lante de Venezuela” was my first recording. First it was released as long-play, measure 45. After that, my friend Mario Covela, who owned a discotheque in Vitoria (Spain), gave an order to press 500 CDs. On this CD you’ll hear the great singer (sonero) Joe Ruiz. 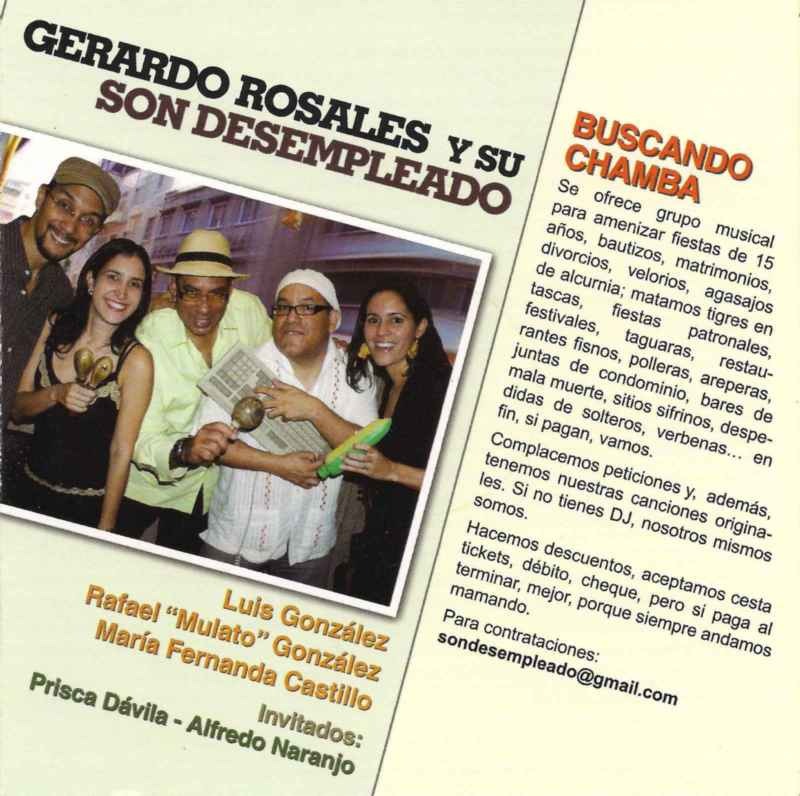 This CD has completely been recorded in Caracas. With the making of this CD I learned about producing, mixing, mastering, distribution and selling -- all ins and outs of the musical market. Once I went, full of hope and faith, to a radio station to present my CD. I did not get further than the reception! I am convinced that a lot of my CD’s that I brought to radio stations ended up in the garbage. 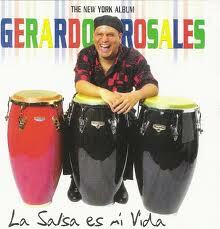 Tell me about how your first album in Holland, “Gerardo Rosales Venezuela Sonora (1996)" came about. I noticed that it has a strong Cuban sonora sound. Although I have also been a salsa lover (salsero), at one point of my life I started to study Cuban music in all its aspects. I listened a lot to ‘conjuntos’, the ‘sonoras’, the ‘soneros’, the ‘changui’, the ‘danzón’ and the Afro Cuban style. All this was really enriching. After having recorded with Bebo Valdés, which definitely marked my life, I decided to record a CD with Cuban elements without loosing its Venezuelan sound. “Venezuela Sonora” opened doors for me in Europe. In 1996 I did a European tour with 30 concerts in Europe. 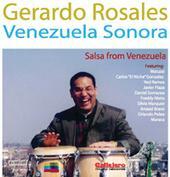 “Venezuela Sonora” was completely recorded in Caracas, but edited in Holland. You also injected some Venezuelan folklore, and include three female voices: Astrid, Silvia Márquez, and Anasol Bravo. It has some impressive guests, such as Maraca, Orlando Poleo, Watussi y Javier Plaza. How did you get this group together? After the recording with Bebo Valdés, which took place in Germany, in 1995, I returned back to Venezuela with the intention to record this CD. I did not plan to invite these musicians, but they all happened to be in Caracas at that time. Very important in this CD are the arrangements of Cuban piano player Roberto González. He was the pianist of La Orquesta América and Federico y su Combo. He had a clear concept of how a ‘ sonora ’ had to sound. His arrangements were spectacular. He has lived in Caracas since the sixties. Unfortunately, he died last year. I have to say that life has given me big present in having so many musical friends who are always willing to participate in my projects. And I also joined them in many musical adventures. Your third album, “Senor Tambó,” was a little bit more eclectic. You increased the Venezuelan folklore presence, did descargas, latin jazz, and straight rumba. It's more of a cocktail, compared to the second one, which was mostly sonora-style. You also included veteran Venezuelan musician Alfredo Naranjo. You also begin flirting with Mongo's music. Through my CDs, I can tell my public in what phase of my life I am. “Señor Tambó” was a musical salad, a product of the multicultural life that I was living at that moment. In Holland I started to see music from a more international point of view and more open. Maybe it would have been much easier to keep playing with “Venezuela Sonora” for some years, but I was anxious to show the world that I could play other things. Thanks to “Señor Tambó,” I could play for the first time at the important North Sea Jazz Festival in 1998. This was a big opportunity for me. “El Venezolano,” your fourth album, is similar to the previous one, because it keeps the Venezuelan rhythms alive, and also includes Latin jazz, vals, ballads, and a significant number of instrumentals. The number of musicians was also reduced. Were you trying to find an identity, experimenting, or you pretty much knew what direction to take with your music? A very important reference is that ‘joropo’ is played with only harp, cuatro, maracas and without congas. As a conga player (tamborero), salsa lover (salsero) and lover of the Cuban rhythms, I wanted to offer my point of view about the Venezuelan music. 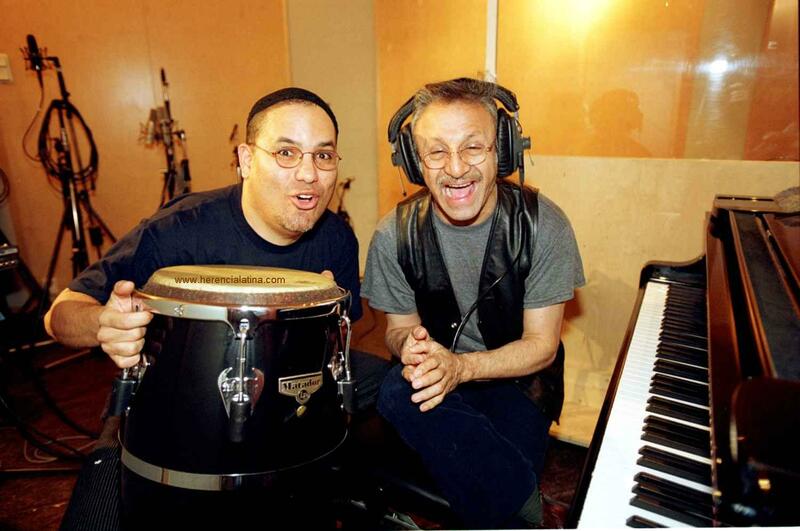 With Bebo Valdés I recorded, for example, the theme “Pierre Jamballah,” a ‘joropo’ that I played with congas and maracas. Till that moment this had not been done often. In 1964 Mongo Santamaría recorded a ‘joropo’ with Venezuelan drummer Pavo Frank Hernández, titled “El Toro. 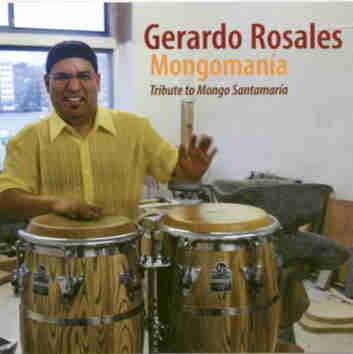 “ So I wanted to follow a musical line so that percussion lovers could say, “Wow, that is Gerardo Rosales.” On the CD “El Venezolano” you’ll hear a theme called “Joropo Loco,” which I recorded with congas, maracas and vocal. This had never been done. The arrangements of this CD are made by Michael Simon and there is a big influence of the ‘father’ of Venezuelan music, Aldemaro Romero. 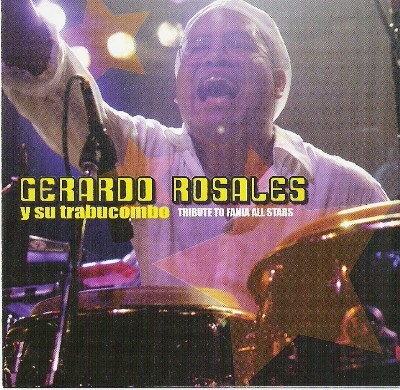 He was the creator of the “Onda Nueva.” With this CD I managed that history recognized me as a conga player (conguero) with personality, like Patato or Ray Barretto. For me, it is very important that people know who you are. This can take some years. Talk about "Proyecto por Venezuela - Reconstrucción," and Gerardo Rosales & Edy Martínez’ "Rítmico y Pianístico." How did you meet Colombian pianist Eddy Martinez? Again, you maintained a reduced number of musicians, and most of the tunes are instrumentals only. Yet, you explored almost every single Afro Caribbean rhythm there is. In December, 1999, Venezuela suffered one of the biggest tragedies. A whole city was covered by an avalanche of mud and stones. Many people died and there were thousands of victims. When this happened, my wife Astrid and I directly went to the Venezuelan Embassy in Holland to offer our help. We collected clothes, medicines and food for the victims and we recorded a CD to raise funds. We also gave a benefit concert to raise funds. This concert was a huge success. We gave all the money we collected to the Red Cross. After months they reported all the investments to us and they showed us all the good things they could do with it. That was really great. Wow, “Rítmico y Pianístico” is a musical jewel for me. We recorded this CD in 11 hours. Edy was at that moment in Holland, working on the arrangements of the Cubop City Big Band, in which I played for 10 years. Edy and I were always having a good time and many times he came to my place to have dinner together. At one of these evenings, while listening to Joe Loco, Peruchin and Charlie Palmieri, the idea came about to record a CD with emphasis on piano. He immediately accepted. There were no rehearsals, no arrangements and no preparations. We went to the studio and started to play. There was chemistry. Leslie López, Leonardo Amuedo, Astrid la Holandesa and Lucas van Merwijk knew what they had to do. Music does not lie. With this project we did a memorable concert in the jazz temple of Holland, the Bimhuis. After that, we did a theatre tour with Luis Perdomo on piano, because Edy went back to New York to work with el Gato Barbieri. On the other hand, it seems that with “La Salsa es mi Vida” you went all the way with a full salsa recording. Astrid has a more prominent role, and you were accompanied by venezuelan musicians that had made a name in New York, like Luisito Quintero, Raúl Agraz and Luis Perdomo. You also had Frankie Vázquez, Ralph Irizarry, and Pedro Emilio Rodríguez (Pete Conde Rodriguez’ son), among others. What did you try to accomplish with this ensemble? I have always been a salsa lover (salsero). I am critical and exacting. That is why it took so long to record a new salsa album. In 2001, a record company, Challenge, did me a proposal to record a salsa CD. I told them that I would love to do it, but not in Holland. The reason for this was that sound engineers in Holland are used to record pop, rock or jazz. They did not have the routine to record salsa and did not know the genre enough to record it. I had fantastic musicians and singers like Frankie Vázquez, Ralph Irrizary, Luisito Quintero, Robert Quintero , Marlon Simon, Rubén Rodríguez, Luis Perdomo , Raúl Agraz , Pete Rodríguez jr., Nelson Hernández, Pablo Santaella , Ray Viera and, as guest, the first Dutch ‘sonera,’ Astrid Pulles. This phantom named Gerardo Rosales does not have fame or money, but he has a lot of friends all over the world and he knows how to make use of the opportunities that life gives him to realize his musical dreams. Talk about Astrid, and how she became part of your band. Astrid Pulles was baptized by me as “La Sorpresa Holandesa.” One day my dear friend and bass player Leslie López, from Puerto Rico, who lives in Holland, invited me to a bar called Canecao in the centre of Amsterdam. That day he also had invited a blond girl that sung “Toro Mata.” Suddenly I saw a Dutch girl dancing, singing and playing the guiro with such a swing. “Wow, qué vaina (Wow, this is amazing), a Dutch girl singing salsa.” That’s when I composed the theme “Sorpresa Holandesa.” Through “La Salsa es mi Vida” the world came to know about Astrid as the first salsa singer given by the land of tulips! Astrid is admirable. She speaks perfect Spanish and loves the Latin culture. That’s why she managed to adapt to this genre. I have to admit that I could not resist her attractiveness and here we are, married with two children: Ana Belén, who is six years old, and Manuel Alejandro, who is three years old. Both were born with the blessing of music and they both know the clave, Thank God! Your next three projects were obviously dedicated to musicians or bands that were an influence in your life: “Tributo a Fania All Stars” and “Tributo a Mongo Santamaría,” as well as “Our Latin Groove,” which is basically a tribute to Joey Pastrana. In the last one, you experiment with salsa sang in Portuguese. The truth is that I do not remain stagnant in one single thing. I create projects that last for a determined period and then they are finished. The European audience is bored quickly, and what keeps me sharp is creating new alternatives. My tributes are honest. They come from a deep wish to teach the audience where the heavy salsa comes from. I know this music since my childhood and I feel proud that I can reveal it. With these repertoires I have realized a lot of concerts all over the world. People that hear this music for the first time directly want to buy a CD. I know persons who for years are dancing on the music of Ismael Rivera, without knowing his name. For this reason, my concerts in occasions are a bit didactic. Above business goes history. 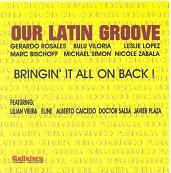 “Our Latin Groove” represents a change of direction. This CD was my guinea pig for a musical change. This CD has more variation in rhythms and languages. For example, special guest Lilian Vieira sings a theme in Portuguese. I feel the necessity to record in different languages. Our music should gain new audience and recover lost territory. Do you have any other tributes that you want to make? They all live in mi memory, but I want to compose my own songs. I have composed a lot of themes that I love to record. 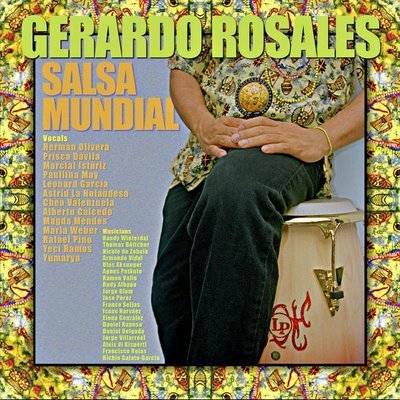 I have just recorded the CD SALSA MUNDIAL, which contains 10 songs of mine. You have recorded as a guest with others artists, but I’m interested if you can share some light on "Bebo Rides Again" and Charanga La Crisis. It would have been a dream to record with Bebo. How did that happen? The encounter with Bebo marked my life. It was really Paquito D’Rivera who invited me. He came to Holland in 1994, to work with a big band. We played together and he told me that he would call me to do a recording with him. The next month he sent me an invitation for the recording with Bebo Valdés in the CD "Bebo Rides Again." These recordings would be held in Germany with Patato, Amadito Valdés, Juan Pablo Torres, Joe Santiago etc. This was really a big change for me. But at the same time I was experiencing a difficult moment, because I stayed illegal in Holland. I decided to take the risk that the police would catch me and deport me immediately and took the train to Germany. I travelled eight frightening hours, hiding myself in the toilet each time the police passed by. Thank God that when I arrived in Dusseldorf, the president of Messidor (Gotz A. Worner) was waiting for me at the railway station. I was able to record this musical jewel and enjoyed an unforgettable week with all these legends. We played, we ate and we had a lot of fun (guarachar). It was incredible. Bebo was so happy. I returned to Holland by train and said to myself, “What the heck, if the police finds me and I will be deported, I recorded a CD with Bebo and that will be for history.” Apparently the police came and asked for my passport. When he saw the cover with “República de Venezuela,” he looked at me and said: “Aaah, Venezuela, no problem.” He didn’t open the passport and left. God was with me that day. I am a fanatic of Charanga music. Charanga is a divine genre. We started as a quintet with flute. 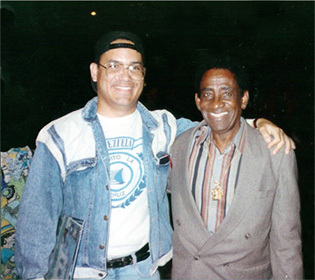 The legendary salsa dancer from New York, Dr. Salsa, always came to the clubs where we would play. One day, he said, “Hey, man, why don’t you add a couple of violins to the group? You know, there are no Charangas here in Holland.” My response was: “Have patience, the crisis is making it difficult for us to grow, but let’s see what happens.” One day Elena, the flutist, brought her two friends, Claudia and Laura Valenzuela, both violinists. They were eager to play and did not care that I did not have the money to pay them. I invited them to jam with us, but they insisted to play, because they already transcribed all the themes. That night Dr. Salsa arrived and saw the quintet with violins. Claudia and Laura played the themes with tremendous knowledge and soul and that day we really won the audience. Dr. Salsa saw his beloved Charanga being born. This was in 2005 and since then we play with this beautiful group. In "Salsa Mundial", your most recent recording, you continue experimenting with rhythms from different countries, and use an assortment of singers of different ethnic backgrounds. Salsa Mundial is my masterwork. I have noticed a lot of Latin influence in many musical projects, but salsa stays hidden. Within this project, ‘salsa dura’ is the protagonist. Other rhythms, and uncommon languages, influence it. The salsa rhythm has the priority. Some artists on this CD have never sung salsa. They belong to the world of pop, jazz or World music. It is very important to me that our music will enter the countries where they have never heard of it. If God gives me life and health, I would like to go give the best of me as producer, composer and percussionist. I work for history. It pleases me that people are willing to listen to good music. With all my heart, I would like to say thank you to you, Eric, and to Rudy Mangual, and to the people who work at Latin Beat who have always supported my work. I would also like to thank my audience for supporting me all these years and for reading this interview. Thanks, Gerardo. These are hard times to make a recording, and you take a big financial risk by doing so. Why do you keep doing it, and what do you think is the key to keep making profit in the process? Any advice to aspiring musicians? Recording CD’s is the most important thing for me. You leave a legacy. If you do not record, you are nothing. Today you can play in a club for 200 persons and tomorrow nobody knows you. Millions of persons in different places all over the world can listen to a recording. Moreover, they can appreciate it every time they listen to it. Thanks to the recordings, we can play our concerts and that way we can make a living. This is what I always explain to the musicians and that is why they like to record with me. Thanks to my CD’s, we have concerts and tours. The CD business is definitively bad. I invest more than I receive. Nevertheless, I keep recording because it is my passion and I know that I have an audience that is waiting for my music. Nevertheless, I consider that we, musicians, nowadays practically give away our songs. The applause and recognitions is our payment. My advice to all musicians is that they integrate to the changes of nowadays. Promote your music at MySpace and Youtube. This is a great opportunity and thousands of persons can listen to your music. Years ago, this was not possible. Nowadays you can check if people like your music. Despite the fact that you do not even earn a dollar with it, it is good for your self-esteem and hope keeps us active.